While moving as the Eye of Kilrogg you have slow fall. The enemy Eye of Zoths have a circle on the ground you can't enter or you get zapped. Once you complete the quests you can click the X to leave or get the eye killed. Just click on X after completing! It returns you back to the quest giver! Bug currently on beta, if you're a warlock, you'll need to erase any Glifo do Olho do Inquisidor on your own Olho de Kilrogg, otherwise the quest giver's eye does not properly activate. The three things you need to find are the huge portal in the middle, to the left of it is a small structure (summoning thingamagig) and to the right is a pit with the demon commander, not the one right behind the structure; I lost quite a bit of time on this one. While doing this quest, currently, your marker doesn't move when you're on the big map. I moved all the way into Suramar before I realized the marker wasn't moving. I lost major time too, i went right into the portal, roaming around, trying to find the quest marker. Thanks Kalec01 for summarizing that all the items you need for the quest are right next to each other. if only legion was all like this totaly fun here. If you're doing this at the same time as Tem um preço, the markers on your map can get confusing. Example: I kept trying to get progress credit at the Braço de Aníquilus, when the relevant bit was the GIANT PORTAL to the right of the arm. Click the eye next to Telmo Maskateiro to take control of it and start your scouting. Avoid the Olho de Zoth - as long as you avoid the circles that show their "visibility" you're good to go. 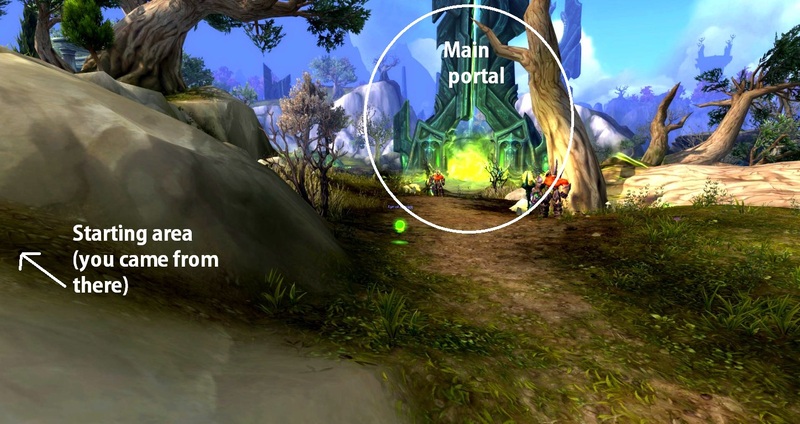 Main Portal: standing at Tehd, look straight out over the Felblaze Ingress. It's the fel pillar shooting a laser beam into the sky. When you're done you can X out of the Eye or hit Esc or right-click > dismiss. Key point for this quest - DO NOT use the main map to guide you on this quest! When using the Eye of Kilrogg, your character marker does not move. This is why coordinates are somewhat useless. The main portal - a giant green portal you can see from the starting point, you can't miss it. The commander - you are looking for Arkethrax, who is in the pit immediately to the RIGHT of the portal. You will need to weave between the stealth-detecting eyes to reach him. The ritual site - This is to the LEFT of the portal, where you will see 4 green spikes coming out of the ground, with 2 Tecefendas Eredars typically standing on either side of it. To deactivate (exit) the Eye of Kilrogg, right-click the buff, click the "X" on the mini action bar on your screen, or press "ESC". Note: Pressing the ESCAPE button on your keyboard will kick you out of the Eye of Kilrogg. Trying to navigate your map (which doesn't work), dodging sentries and needing to close map urgently at times is a deadly combination. I kept getting kicked off the eye every time after a few seconds. When I dismissed my battle pet I was able to complete the quest. So, if you are having problems make sure you have no pets of any kind. If you have an addon like CollectMe that randomly summons a companion on moving you will need to turn that off for this quest. It will cancel the eye when it summons a new companion. The map marker doesn't work for this, but the quest arrow on the mini map does. Just follow where it's pointing (or use the references listed in the other comments) and you'll be good to go! Bah! That portal foundation is all wrong. It is fully exposed to tampering. Whoever made this should feel bad about themselves. Your portal is bad and you should feel bad. Well now, Arkethrax is leading this band? This is an opportunity I did not expect. What is this mumbling trash? They call THIS a ritual? I could rain fire down on all of these eredar and I don't think it could make this ritual any worse than it already is. Don't ask where I got the eye. Worst case is I tell you and then it gets all awkward between us. 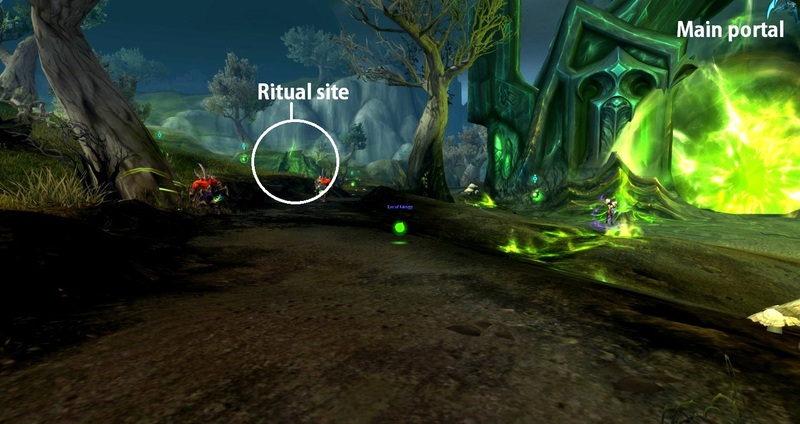 If you are a warlock make sure you do not have your eye of kilrogg glyphed. If you do clicking on Tehd's eye will just summon yours and you will not be able to do the quest. Found this out the hard way. If you're on the Warrior class hall quest "The Fate of Hodir" this zone is phased for that. Using the eye to do this quest at the same time will not work, you will not get credit for checking out the spots. Took me a while to figure out why it wasn't working for me. I was on the last mission of the warrior class order hall missions and couldn't complete the parts of the quest. 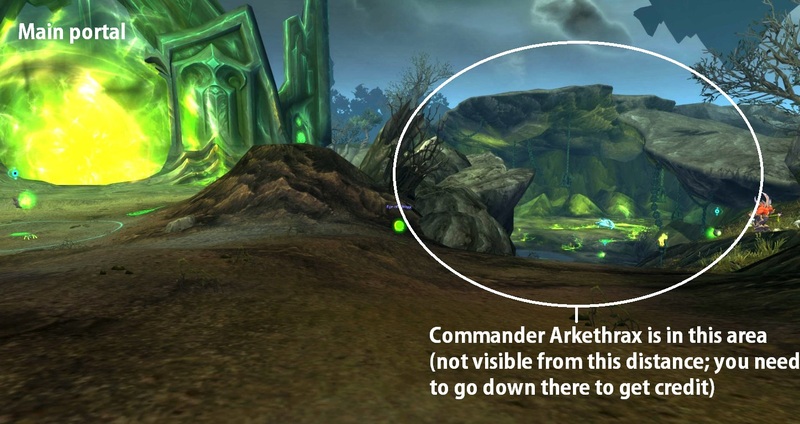 If you don't want to risk all the eyes in front of the Commander (Arkethrax), you can actually navigate across the rock ledge above him (to the south) and get credit. Avoid the eyes completely! It may be stating the obvious, but you will see some flying things with a circular symbol above them. Those are the ones that can stop you, and send you back to the questgiver. You have to avoid the blue circles beneath them. The other guards will not see you if you are the eye. Another obvious point, is that you have to click on the green eye and search as the eye, not your character. As of 8.0.1 the eye isn't appearing upon accepting the quest. Use o Olho de Kilrogg de Telmo para investigar a Passagem Brasavil. Uma coisa é ser cego, outra é ser estúpido. Esse prodígio sem olhos aqui ao meu lado quer entrar logo na Passagem Brasavil sem se preparar antes. Bah! Eu estou dizendo que é melhor patrulharmos a área antes. Tome, darei para você um olho extra que eu peguei em um lugar cujo nome é melhor não dizer. Vá até a Passagem Brasavil, dê uma olhada nas coisas por lá e tente não levar a pior. Por quê? Por que os demônios seriam tão ruins, dentre tantas outras coisas, em evocar outros demônios?